"Do They Know It's Christmas?" is a song written in 1984 by Bob Geldof and Midge Ure in reaction to television reports of the 1983–1985 famine in Ethiopia. It was first recorded in a single day on 25 November 1984 by Band Aid, a supergroup put together by Geldof and Ure and consisting mainly of the biggest British and Irish musical acts at the time. The single was released in the United Kingdom on 3 December 1984 and aided by considerable publicity it entered the UK Singles Chart at number one and stayed there for five weeks, becoming the Christmas number one of 1984. The record became the fastest selling single in UK chart history, selling a million copies in the first week alone and passing 3 million on the last day of 1984, on the way to displacing Wings's "Mull of Kintyre" as the biggest-selling single of all time in the UK. It held this title until 1997 when it was overtaken by Elton John's "Candle in the Wind 1997", released in tribute to Diana, Princess of Wales following her death. The original version of "Do They Know It's Christmas?" has sold 3.8 million copies in the UK to date. The song was also a major success around the world, reaching number one in thirteen other countries outside the UK. In the US, the single fell short of the top ten in the Billboard Hot 100 due to a lack of airplay, but it had sold an estimated 2.5 million copies in the US by January 1985. Worldwide the single had sold 11.7 million copies by 1989. Geldof's cautious hope was that the single would raise £70,000 for Ethiopia, but "Do They Know It's Christmas?" raised £8 million within twelve months of release. The single's worldwide success in raising awareness and financial relief for the victims of the Ethiopian famine led the recording of several other charity singles in the UK and in other countries, such as "We Are the World" by USA for Africa. The song also led to various spin-off charity events, such as Comic Relief, and the Live Aid concert which would take place seven months later in July 1985. "Do They Know It's Christmas?" was re-recorded three times: in 1989, 2004, and 2014. All the re-recordings were also charity records; the 1989 and 2004 versions also provide money for famine relief, while the 2014 version was used to raise funds for the Ebola crisis in West Africa. All three of these versions also reached number one in the UK, with the 1989 and 2004 versions also becoming the Christmas number ones for their respective years. The 2004 version of the song was also a UK million seller, with 1.8 million copies sold. The song was inspired by a series of reports that Michael Buerk made for BBC television news programmes in 1984, which highlighted the famine in Ethiopia that was taking place at the time. The BBC News crew were the first to document the famine, with Buerk's report on 23 October describing it as "a biblical famine in the 20th century" and "the closest thing to hell on Earth". The reports shocked the UK, motivating the British people to inundate relief agencies, such as Save the Children, with donations, and also to bring world attention to the crisis in Ethiopia. The Boomtown Rats singer Bob Geldof and his partner, television presenter Paula Yates, watched the 23 October report and were also deeply affected by it. On 2 November Yates travelled from the couple's home in London to the Tyne Tees studio in Newcastle upon Tyne where she was presenting the weekly live music show The Tube. Among the acts performing on that week's programme were Ultravox, promoting their greatest hits album The Collection. Ultravox's front man Midge Ure happened to be chatting to Yates in the dressing room after the show when Geldof called her. On discovering that she was with Ure, an old friend of Geldof's, he asked to speak to Ure and told him that he wanted to do something to alleviate the suffering in Ethiopia. Ure immediately agreed to help and the pair arranged to meet and discuss ideas over lunch the following Monday, 5 November, quickly coming to the conclusion that the best option would be to make a charity record. Following their meeting, Geldof immediately set about recruiting other well known musicians to participate on the record. Geldof said, "I then rang Sting and he said, yeah, count me in, and then [Simon] Le Bon, he just immediately said tell me the date and we'll clear the diary. The same day I was passing by this antique shop and who is standing in there but Gary Kemp, just about to go off on tour to Japan. He said he was mad for it as well and to wait 10 days till they [Spandau Ballet] got back in the country... suddenly it hit me. I thought, 'Christ, we have got the real top boys here', all the big names in pop are suddenly ready and willing to do this... I knew then that we were off, and I just decided to go for all the rest of the faces and started to ring everyone up, asking them to do it." Further phone calls from Geldof also secured promises of everybody involved in the record's making to provide their services free of charge, including most of the UK music magazines which donated advertising space in their publications to promote the single, Geldof's record label Phonogram who released the single, their parent company PolyGram who distributed it, and the artist Peter Blake who created the single's sleeve. It was lucky in a way, because I had already written this song, which I had provisionally called 'It's My World', and I knew it would be suitable if I just changed the words a bit and called it 'Do They Know It's Christmas?' Midge, reliable as ever, sent down this tune which is the sort of Christmassy bit at the end and we married the two together. Ure recorded Geldof and his guitar and used the recording to develop Geldof's ideas later back in his home studio, adding his own melody onto the end as a chorus. He later stated that he had been unable to improve on Geldof's lyrics and left most of them as they were, with the exception of the line "And there won't be snow in Africa this Christmas time" – the original lyric substituted "Africa" with "Ethiopia" but Ure decided that this did not scan. Geldof's original idea had been to ask Trevor Horn to produce the song. At the time Horn was an in-demand producer, having produced the three number one singles in 1984 for Frankie Goes to Hollywood. Although Horn was receptive to the idea, he told Geldof that he would need at least six weeks to be able to produce the song, which made it impossible for it to be ready by Christmas. He did, however, offer the use of Sarm West Studios in Notting Hill in west London (owned by Horn and his wife Jill Sinclair) free of charge for twenty-four hours on Sunday 25 November. Horn would later remix and co-produce the 12" version of the single, as well as remixing the single for its 1985 re-release. In Horn's absence Ure was assigned the job of producer and he spent several days in his home studio with his engineer Rik Walton to create the song's backing track, programming the keyboards and drum machines and using a sample of the drums from the title track of Tears for Fears album The Hurting for the song's intro. John Taylor of Duran Duran and Paul Weller visited Ure's studio the day before the recording at Sarm West in order to add bass guitar and lead guitar respectively, although Ure and Weller later agreed that the lead guitar did not fit the predominantly synthesizer-based song and subsequently decided not to use Weller's contribution. Ure sang the original guide vocal, although Simon Le Bon and Sting both came to Ure's studio to add the vocals for their lines. While Ure was occupied creating the song's backing track in the studio, Geldof was busy contacting various British artists to ask them to appear for the recording session. His plan was to have the biggest names in British music at the time appear on the record, and few declined: Geldof later revealed that only three people had turned him down, although he refused to disclose who they were. Those he asked but who were unable to appear instead sent recorded messages of support that appeared on the single's B-side, including David Bowie and Paul McCartney. Another UK act who had been successful in 1984, The Thompson Twins, were unable to appear on the Band Aid record as they were out of the country and were made aware of the recording too late to return and be involved in it, but they donated part of the proceeds of their then current single "Lay Your Hands on Me" to the Action for Ethiopia charity. Geldof kept a November appointment with BBC Radio 1 DJ Richard Skinner to appear on his show, but instead of discussing his new album (the original reason for his booking), he used the airtime to publicise the idea for the charity single, so by the time the musicians were recruited there was intense media interest in the subject. Geldof and Ure arrived at Sarm West at around 8 am on Sunday 25 November with the media in attendance outside. With recording scheduled to begin at 10:30 am the artists began arriving. Geldof had arranged for the UK newspaper The Daily Mirror to have exclusive access inside the studio, and ensured that a 'team photo' was taken by the newspaper's photographer Brian Aris before any recording got under way, knowing that it would be ready in time to appear in the following day's edition of the newspaper and help publicise the record. The photograph also appeared on the back cover of the single. Ure played the backing track and guide vocals to the artists and then decided, as a way of getting all involved straightaway, to record the climax first. The artists were put in a huge group and sang the 'Feed the world, let them know it's Christmas time' refrain over and over again until it was complete. Having recorded the group, Ure chose Tony Hadley of Spandau Ballet to be the first singer into the studio to record his solo part. Hadley admitted that this had been nerve-wracking, knowing that all his contemporaries were watching him. One by one the other assigned singers then did likewise, with Ure taping their efforts and then making notes on which segments would be cut into the final recording. Le Bon, despite having already recorded his part at Ure's house, re-recorded it so he could be part of the moment. Sting also recorded his words again, this time to provide harmony vocals. Despite being lead singers themselves, both Geldof and Ure had already decided that they would not sing any solo lines, although both took part in the 'feed the world' finale. Ure later stated in his autobiography that he was constantly battling with Geldof, and telling him to leave when he would come into the production booth and wrongly tell the artist behind the microphone what to sing. Phil Collins arrived with his entire drum kit to record a live drum track on top of the already programmed drum machine. He set up the kit and then waited patiently until early evening until after all the vocals had been recorded. Ure was content with the first take that Collins performed, but the perfectionist Collins was unhappy with it and asked for a second take to be recorded, which he was satisfied with. Although the majority of the artists who took part were the UK's biggest musical stars at the time, there were a few unusual participants. Members of the US group Kool & the Gang appeared on the record because they were signed to the same record label as the Boomtown Rats, and just happened to be visiting Phonogram's London offices on the day that Geldof walked in to pitch his idea for the charity single to the label. Singer Marilyn, who had scored a couple of chart hits a year earlier but whose star had faded throughout 1984, saw the opportunity to reclaim the spotlight and turned up to the recording despite not being invited to take part, a fact overlooked by Geldof and Ure who felt any publicity was good publicity and the more stars they could get to appear on the record, the better. Actor Nigel Planer, who had reached number two earlier in the year with a cover version of "Hole in My Shoe" in the guise of his character Neil from the television comedy series The Young Ones, also showed up uninvited and in character as Neil to play up to the cameras, and after being tolerated for a while was sent away by Ure. Once Status Quo produced their bag of cocaine and the booze started to flow – I brought six bottles of wine from my flat, which disappeared in a minute – it became a party. Geldof had been keen to include Culture Club's Boy George on the single, at the time one of the biggest music stars in the world, and had called him in New York the day before the recording to insist that George turn up. By midday, with George still absent, an irate Geldof telephoned him again demanding to know where he was. Having only gone to bed a few hours before, a sleepy George was woken up by Geldof insisting that he get onto a Concorde transatlantic flight later that morning. However, George went back to sleep following the phone call, and only made it onto the last Concorde flight of the day later that afternoon. George eventually arrived at Sarm West at 6 pm and went immediately into the recording booth to deliver his lines, the last solo artist of the day. Once George's contribution had been recorded, Ure began working on the mix as the participants began to party in the studio. A B-side was also produced by Trevor Horn in his own studio, using the same instrumental track and featuring messages from artists who had been at the recording, and also from those who had been unable to attend, including David Bowie, Paul McCartney, the members of Big Country and Holly Johnson from Frankie Goes to Hollywood. The song comprises two parts: a verse and bridge which allow individual singers to perform different lines; and a chorus in the form of two repeated phrases by ensemble. The first line of the recording is sung by Paul Young on the 1984 version, Kylie Minogue on the 1989 version, Chris Martin of Coldplay on the 2004 version, and One Direction on the 2014 version. The line was originally written for David Bowie who finally sang it at the Live Aid concert in 1985. The following morning Geldof appeared on Mike Read's BBC Radio 1 Breakfast Show to promote the record and promised that every penny would go to the cause. Most record retailers agreed to sell the record at its cost price of £1.35 including VAT: however, some refused, citing cost pressures. Geldof was also incensed that the British Government refused to waive the VAT on the sales of the single. Geldof made the headlines by publicly standing up to Prime Minister Margaret Thatcher. In the end the UK government relented and donated an amount to the charity equal to the amount of tax they had collected on the single. Radio 1 began to play the song every hour – normally an A-list single got seven or eight plays per day. The number one single at the time of its release was "I Should Have Known Better" by Jim Diamond, and Diamond was quoted as saying, "I'm delighted to be at number one, but next week I don't want people to buy my record; I want them to buy Band Aid instead". The song had advance orders of 250,000 within a week of its recording, and orders from record dealers had topped one million by 8 December. In order to meet demand, Phonogram had all five of their European factories put to work pressing the single. "Do They Know It's Christmas?" was released on Monday 3 December 1984. It received further publicity from a launch party on 7 December at the Royal Albert Hall during the charity event "Dinner at Albert's", an evening of music to raise money for Save the Children and the Ethiopia Famine Relief Fund. The single entered the UK Singles Chart the following week at number one, outselling all the other records in the chart put together, with the 7" single alone selling 200,000 copies in the first two days of release. In the United States, the video was played on MTV frequently throughout the Christmas season. 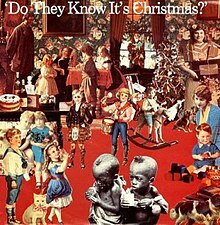 Released in the US on 10 December 1984 on Columbia Records, "Do They Know It's Christmas?" sold 1.9 million copies in its first eleven days on release but did not reach number 1 there, due to the more complex nature of the chart system, which counted airplay as well as sales. Despite outselling the official number 1 by four to one, it did not make the top ten due to a lack of airplay, ultimately peaking at number 13 on the Billboard Hot 100. Due to the time constraints of releasing the single as quickly as possible, the promotional video for the song simply featured footage from the recording session. David Bowie, who had been Geldof's original choice to sing the song's opening line but who had been unable to attend the recording, flew into England from Switzerland to record a short introduction for the video to be played on the BBC's flagship television music show Top of the Pops. However, Geldof was unhappy when he discovered that the show's regulations meant that the song and its video could not be played until it had actually charted. Undeterred, he contacted BBC1 controller Michael Grade directly and persuaded Grade to order that every programme preceding that week's episode of Top of the Pops should start five minutes early to make space to broadcast the song's video (complete with Bowie's introduction) just before the show. Each week of its stay at number one, the video was shown on Top of the Pops. However, for the Christmas Day special edition of the programme, most of the artists on the record appeared in the studio to mime to the song as it was relayed through the speaker system. The two most notable absentees were George Michael and Bono: during Michael's line the cameras focussed on the studio audience, while Paul Weller mimed Bono's line to the camera. The charity received a further boost during Band Aid's five week tenure at the top of the UK charts with Wham! at number 2 with their double A-side "Last Christmas"/"Everything She Wants". Wham! singer George Michael had appeared on the Band Aid single and he and fellow band member Andrew Ridgeley donated all the royalties from their single to the Band Aid Trust. "Last Christmas"/"Everything She Wants" also ended up selling over a million copies and became the biggest-selling single never to reach number 1 in the UK. A 30-minute video titled 'Do They Know It's Christmas?' – The Story of the Official Band Aid Video was released in the UK on 15 December 1984 and in the US on 18 December 1984 on VHS and Betamax formats. The video featured documentary footage shot at the recording session and interviews with Geldof and Ure, as well as the completed promotional video. At the 1986 Grammy Awards the song's video was nominated for the Best Music Video, Short Form award, eventually losing out to its US counterpart song "We Are the World". The reception in December 1984 to the original single from the UK music press was mixed. Under a caption of "TURKEY" (a double meaning referring both to the traditional British Christmas meal and an artistic failure), the biggest selling music paper NME dismissed the song with the single line, "Millions of Dead Stars write and perform rotten record for the right reasons". The other two major music papers looked upon the record more favourably, recognising that while musically the song was flawed, its intentions were admirable. Sounds said, "It's far from brilliant (if not quite the Bland Aid some have predicted) but you can have fun playing Spot the Star on the vocals, and it deserves to sell by the truckload". Melody Maker stated, "Inevitably, after such massive publicity, the record itself is something of an anti-climax, even though Geldof's sense of universal melodrama is perfectly suited to this kind of epic musical manifesto. Midge Ure's large-screen production and the emotional vocal deliveries of the various celebrities matches the demonstrative sweep of Geldof's lyric, which veers occasionally toward an uncomfortably generalised sentimentality which threatens to turn righteous pleading into pompous indignation. On the other hand, I'm sure it's impossible to write flippantly about something as fundamentally dreadful as the Ethiopia famine." The song has received criticism for what has been described as a colonial western-centric viewpoint and condescending stereotypical descriptions of Africa. African activists and Twitter users complained that the song disregarded the diversity of the continent of Africa and ultimately did more harm than good for the people. In the 2014 version, several lyrics that were previously criticised were rewritten, and the song was changed to focus on Ebola rather than the original version's famine. The new lyrics have also been criticised for stereotypes and condescension. Musician Fuse ODG turned down a request to sing on the 2014 version, stating that the lyrics of the song do not reflect what Africa truly is. He cited lyrics such as "There is no peace and joy in west Africa this Christmas"; saying he goes to Ghana yearly for the sole purpose of peace and joy, so singing such lyrics would be a blatant lie. Geldof and Ure themselves later recognised the musical limitations of "Do They Know It's Christmas? ": in his typically blunt manner, Geldof told Australia's Daily Telegraph in 2010, "I am responsible for two of the worst songs in history. The other one is 'We Are the World'." Ure's assessment in his autobiography was that "it is a song that has nothing to do with music. It was all about generating money... The song didn't matter: the song was secondary, almost irrelevant." In 2005 a parody version entitled "Do They Know It's Hallowe'en?" was created to poke fun at the lyrics in the original version. "Do They Know It's Christmas?" was reissued the following year on 29 November 1985, reaching number 3 in the UK Singles Chart the week following Christmas. The 1985 single was remixed by Trevor Horn, the intended producer of the original version, and it included an updated B-side entitled "One Year On (Feed the World)", beginning and ending with a recording of a telephone message from Geldof and in between featuring Ure reciting a list of what had been bought with the money raised during the previous 12 months. ^ Annie Lennox's name also appears on the sleeve credits as a recorded message from her was due to be included on the B-side, but the message did not arrive in time before the record was pressed. ^ Midge Ure stated in his autobiography that most of the bass line was created and played on a synthesizer (later revealed to be the OSCar), but that John Taylor had added some bass guitar to the song in Ure's home studio on 24 November 1984. A second version of "Do They Know It's Christmas?" was recorded under the name of Band Aid II in 1989, overseen by the most successful British production team of the late 1980s, Stock Aitken Waterman. Geldof had telephoned Pete Waterman to ask him to produce a new version of the song to aid the ongoing situation in Ethiopia, and within 24 hours the recording session had been arranged at Stock Aitken Waterman's studios on London's South Bank. The recording took place over the weekend of 2 and 3 December, and featured several artists who had already been produced by SAW, including Kylie Minogue, Jason Donovan, Bananarama, Sonia, and Cliff Richard, as well as other artists who had big hits in 1989, such as Lisa Stansfield, Jimmy Somerville, Wet Wet Wet and Bros. Bananarama's Sara Dallin and Keren Woodward became the only artists to appear on both the 1984 and 1989 versions of the record. Siobhan Fahey, who had been part of Bananarama's line-up at the time the first recording of the song was released, had left the group in 1988. The lyrics were rearranged for a more traditional 'verse and chorus' structure, with the opening verse being split in two with a short repeat of the ending chorus being played at the end of both, followed by the "here's to you" section and a final lengthened version of the closing chorus (with commentary by Michael Buerk played over the outro in the music video). The sleeve also credits "A Linn" with playing drums on the record, a joking reference to the programmed Linn drum machine. Band Aid 20 recorded a third version of the song in November 2004 for the twentieth anniversary of the original recording, and again got to number one. The recording and release of the single tied in with the release of the Live Aid concert on DVD for the first time. The idea was prompted by Coldplay's Chris Martin, although Geldof and Ure both got quickly involved. Geldof did the publicity and educated the younger artists on the issues (some of them weren't born, or were very young, when the original was recorded) while Ure assisted producer Nigel Godrich and filmed the event for the corresponding documentary. The gathering of the artists to record the song's chorus took place at AIR Studios in Hampstead in north London on Sunday 14 November 2004, although the backing track and many of the solo lines had been recorded over the previous two days. Damon Albarn did not take part in the recording but turned up to serve tea to the participants. This version of the song featured an extra segment—a rap by Dizzee Rascal in the midst of the "here's to you" section. Bono flew in especially from Ireland late on Sunday evening to sing the same line as he had done two decades earlier, making him the sixth artist to appear on two versions, in addition to Geldof, Ure, Paul McCartney, Sara Dallin and Keren Woodward (Bananarama). "Do They Know It's Christmas? (2014)"
At a press conference on 10 November 2014, Geldof and Ure announced that another group of artists would come together to re-record the song, this time under the banner of Band Aid 30 and in aid of the Ebola crisis. It was released on the following Monday, 17 November, 11 days short of the 30th anniversary of the release of the original version of the track. Tracey Emin provided the artwork and Paul Epworth produced the track. Vocal contributions came from artists including Ed Sheeran, One Direction, Paloma Faith, Ellie Goulding, Seal, Sam Smith, Sinéad O'Connor, Rita Ora, Emeli Sandé, Bastille and Olly Murs. Returning guest musicians from previous versions of the song included Chris Martin (who recorded the opening lines of the 2004 version) and Bono (who sang the tenth line in both the 1984 and 2004 versions). The line "Well, there won't be snow in Africa this Christmas time" was changed to "Bring peace and joy this Christmas to West Africa". A German-language version of "Do They Know It's Christmas?" was released on 21 November 2014. It was produced by Vincent Sorg and Tobias Kuhn and features vocals from artists including 2raumwohnung, Andreas Bourani, Die Toten Hosen, Jan Delay, Joy Denalane, Max Raabe, Milky Chance, Peter Maffay, Silbermond, Thees Uhlmann, and Wolfgang Niedecken. ITV television show Spitting Image produced a song entitled "We're Scared of Bob" with the various artists suggesting they are only making the record because they were too afraid to say no when Bob Geldof asked them. Slade released a version of the song on their 1985 Christmas album Crackers: The Christmas Party Album, with vocals by Noddy Holder and Jim Lea and proceeds from the track, along with a further Slade release "Do You Believe in Miracles" (which told the story of Geldof's rise and demise in the pop scene and then his determination to raise money for the famine victims), were donated to the Band Aid Trust. ^ a b "Band-Aid Rocks the Shops". The Sun. London, England: News International. 4 December 1984. p. 1. ^ a b "Band Aid sales top 3m – proceeds set to reach Ethiopia by summer". Music Week. London, England: Morgan–Grampian Publications: 3. 12 January 1985. ^ Allison, David (18 August 2017). "Mull of Kintyre – Looking back on a Scottish mega-hit". BBC Scotland News. Retrieved 7 December 2017. ^ Sedghi, Ami (4 November 2012). "UK's million-selling singles: the full list". The Guardian. London, England: Guardian Media Group. Retrieved 4 November 2012. ^ a b c d Copsey, Rob (19 September 2017). "he UK's Official Chart 'millionaires' revealed". The Official Charts Company. ^ Green, Paul (5 January 1985). "Ethiopia-Aid Single, Video Take Off". Billboard. New York City, USA: Billboard Publications: 3. ^ a b Holden, Stephen (27 February 1985). "The Pop Life; Artists Join in Effort for Famine Relief". The New York Times. New York City, USA: The New York Times Company. Retrieved 27 July 2014. ^ McFarlen, Donald. Guinness Book of World Records, 1989, page 155-156. Jim Pattison Group. Retrieved 2 February 2012. ^ a b c d e f Presenter: Midge Ure (21 October 2004). Band Aid: The Song That Rocked the World (Documentary)|format= requires |url= (help) (TV Production). ^ "1984: Extent of Ethiopia famine revealed". BBC. 7 January 2018. ^ a b c d e f g h i j Ure, Midge (2013). If I Was... An Enhanced Updated Autobiography. Acorn Digital Press. ^ a b c McIlhenney, Barry (8 December 1984). "Feed the World". Melody Maker. London, England: IPC Media: 24–25. ^ a b c "Stars rally round". Music Week. London, England: Morgan–Grampian Publications: 1. 1 December 1984. ^ "More Action for Ethiopia". Melody Maker. London, England: IPC Media: 4. 8 December 1984. ^ Eggar, Robin (18 November 2004). "From fears to tears". The Daily Telegraph. London, England: Telegraph Media Group. Retrieved 2 July 2014. ^ a b c d "Band Aid bonanza". Music Week. Morgan-Grampian Publications: 1 & 4. 15 December 1984. ^ a b Maconie, Stuart (2014). The People's Songs: The Story of Modern Britain in 50 Songs. London, England: Ebury Press. p. 291. ISBN 978-0-09193-380-7. ^ "Ethiopia – dealers 'superb'". Music Week. Morgan-Grampian Publications: 4. 8 December 1984. ^ Davis, Sharon (1999). '80s Chart Toppers: Every Chart-Topper Tells a Story. Mainstream Publishing. ISBN 978-1-85158-838-1. ^ a b Jones, Peter; Dupler, Simon (15 December 1984). "Ethiopia Aid Single Due Out in U.S.". Billboard. New York City, USA: Billboard Publications, Inc. 96 (50): 6 & 78. ^ Kopf, Biba (8 December 1984). "Singles". NME. London, England: IPC Media: 21. ^ Johnson, Garry (8 December 1984). "Singles". Sounds. London, England: Spotlight Publications: 16. ^ Jones, Allan (8 December 1984). "Singles". Melody Maker. London, England: IPC Media: 27. ^ "Live Aid, Band Aid, USA for Africa: Did pop stars and hit songs help Ethiopia famine victims?". Slate Magazine. ^ "Bono had the good sense to change that awful lyric for the new "Do They Know It's Christmas?"". ^ "uprisingradio.org » Do They Know How Racist They Sound?". ^ "In Africa, do they know it's Christmas time at all? - Crikey". crikey.com. ^ "The 15 Worst Christmas Songs, Ranked". pastemagazine.com. ^ "'Do They Know It's Christmas?' Raises Hackles As Well As Dollars". NPR.org. Retrieved 2019-03-26. ^ Malone, Barry. "'We got this, Bob Geldof, so back off'". www.aljazeera.com. Retrieved 2019-03-26. ^ "Do They Know It's Christmas 2014 remake is about Ebola, featuring Bono, Sam Smith, and other Brits. It's terrible (VIDEO)". Slate Magazine. ^ "Band Aid 30 lyrics: Reworked lyrics for Ebola-themed 'Do they know it's Christmas?' revealed". The Independent. ^ "Outrage over 'ignorant' Band Aid 30 Ebola lyrics". ^ "Why Adele was right to ignore Bob Geldof and Band Aid". Telegraph.co.uk. 18 November 2014. ^ "Band Aid 30: Fuse ODG turned down Bob Geldof's song over 'negative' image of Africa". The Independent. ^ Bim Adewunmi. "Band Aid 30: clumsy, patronising and wrong in so many ways". the Guardian. ^ "Why I had to turn down Band Aid". The Guardian. 19 November 2014. Retrieved 21 December 2014. ^ Ollerenshaw, Tracy (17 November 2014). "Bob Geldof: Fuse ODG felt awkward about Band Aid track". BBC. Retrieved 21 December 2014. ^ McGregor, Nesta (18 November 2014). "Band Aid is 'detrimental' to African continent says Fuse ODG". BBC. Retrieved 21 December 2014. ^ Denham, Jess (18 November 2014). "Band Aid 30: Fuse ODG turned down Bob Geldof single over 'negative' image of Africa". The Independent. Retrieved 22 December 2014. ^ McCabe, Kathy (27 November 2010). "Sir Bob Geldof's tacky curse of Christmas". Daily Telegraph. Sydney, Australia: Nationwide News. Retrieved 24 July 2014. ^ "BBC NEWS - Entertainment - World premiere of Band Aid song". ^ "In a Send-Up of Charity Songs, the Elite Of Indie Rock Take On Halloween Revelry". The New York Times. 5 October 2005. ^ "Band Aid reissue – onus on dealers". Music Week. London, England: Morgan–Grampian Publications: 4. 23 November 1985. ^ Band Aid (1984). Do They Know It's Christmas? (Record sleeve). Phonogram. FEED 1. ^ Wiffen, Paul (September 1999). "Oxford Synthesizer Company OSCar". Sound on Sound. Archived from the original on 3 March 2016. ^ Kent, David (1993). Australian Chart Book 1970–1992. St Ives, New South Wales, Australia: Australian Chart Book. p. 26. ISBN 0-646-11917-6. ^ "Austriancharts.at – Band Aid – Do They Know It's Christmas?" (in German). Ö3 Austria Top 40. ^ "Ultratop.be – Band Aid – Do They Know It's Christmas?" (in Dutch). Ultratop 50. ^ "RPM 100 Singles, January 5, 1985". RPM, Vol. 41 No. 17. Canada: Library and Archives Canada. Retrieved 27 July 2014. ^ "Danishcharts.com – Band Aid – Do They Know It's Christmas?". Tracklisten. ^ "Europarade Hot 100". Music Week. London, England: Morgan–Grampian Publications. 12 January 1985. ^ "Lescharts.com – Band Aid – Do They Know It's Christmas?" (in French). Les classement single. ^ a b "Hits of the World". Billboard. Nielsen Business Media: 62. 9 February 1985. Retrieved 5 December 2018. ^ "Nederlandse Top 40 – Band Aid" (in Dutch). Dutch Top 40. ^ "Charts.nz – Band Aid – Do They Know It's Christmas?". Top 40 Singles. ^ "Swedishcharts.com – Band Aid – Do They Know It's Christmas?". Singles Top 100. ^ "Band Aid Chart History (Hot 100)". Billboard. ^ "Offiziellecharts.de – Band Aid – Do They Know It's Christmas?". GfK Entertainment Charts. ^ "Listy bestsellerów, wyróżnienia :: Związek Producentów Audio-Video". Polish Airplay Top 100. Retrieved 27 December 2016. ^ "Archívum – Slágerlisták – MAHASZ" (in Hungarian). Stream Top 40 slágerlista. Magyar Hanglemezkiadók Szövetsége. Retrieved 4 January 2019. ^ "Portuguesecharts.com – Band Aid – Do They Know It's Christmas?". AFP Top 100 Singles. Retrieved 4 January 2019. ^ "Top 100 Singles January 3 – December 29, 1984". Music Week. London, England: Spotlight Publications: 37. 26 January 1985. ^ Scapolo, Dean (1997). "Top Songs 1985". New Zealand Music Charts 1966–1996: Singles. Wellington, New Zealand: IPL Books. p. 358. ISBN 978-0-90887-600-6. ^ "Top 100 Singles January 5 – December 28, 1985". Music Week. London, England: Spotlight Publications: 10. 18 January 1986. ^ "Canadian single certifications – Band Aid – Do They Know It's Christmas?". Music Canada. Retrieved 28 June 2012. ^ "Gold-/Platin-Datenbank (Band Aid; 'Do They Know It's Christmas?')" (in German). Bundesverband Musikindustrie. Retrieved 4 May 2018. ^ "Italian single certifications – Band Aid – Do They Know It's Christmas?" (in Italian). Federazione Industria Musicale Italiana. Retrieved 2 January 2019. Select "2018" in the "Anno" drop-down menu. Select "Do They Know It's Christmas?" in the "Filtra" field. Select "Singoli online" under "Sezione". ^ "British single certifications – Band Aid – Do They Know It's Christmas?". British Phonographic Industry. Retrieved 28 June 2012. Select singles in the Format field. Select Platinum in the Certification field. Type Do They Know It's Christmas? in the "Search BPI Awards" field and then press Enter. ^ "American single certifications – Band Aid – Do They Know It's Christmas?". Recording Industry Association of America. Retrieved 28 June 2012. If necessary, click Advanced, then click Format, then select Single, then click SEARCH. ^ a b "News Extra: Band Aid II". Record Mirror. London, England: United Newspapers: 54. 9 December 1989. ^ a b "Year-End Chart '89: Top 100 Singles". Music Week. London, England: Spotlight Publications: 16. 3 March 1990. ^ Band Aid II (1989). Do They Know It's Christmas? (Record sleeve). PWL/Polydor. FEED 2. ^ "Australian-charts.com – Band Aid II – Do They Know It's Christmas?". ARIA Top 50 Singles. ^ "Ultratop.be – Band Aid II – Do They Know It's Christmas?" (in Dutch). Ultratop 50. ^ "Offiziellecharts.de – Band Aid II – Do They Know It's Christmas?". GfK Entertainment Charts. ^ "Dutchcharts.nl – Band Aid II – Do They Know It's Christmas?" (in Dutch). Single Top 100. ^ "Charts.nz – Band Aid II – Do They Know It's Christmas?". Top 40 Singles. ^ "Swedishcharts.com – Band Aid II – Do They Know It's Christmas?". Singles Top 100. ^ "Swisscharts.com – Band Aid II – Do They Know It's Christmas?". Swiss Singles Chart. ^ "British single certifications – Band Aid II – Do They Know It's Christmas?". British Phonographic Industry. Retrieved 28 July 2014. Select singles in the Format field. Select Platinum in the Certification field. Type Do They Know It's Christmas? in the "Search BPI Awards" field and then press Enter. ^ a b Murray, Shane (30 November 2004). "How Band Aid 20 came together". BBC News. Retrieved 22 September 2014. ^ a b Youngs, Ian (14 November 2004). "Blogging the Band Aid recording". BBC News. Retrieved 22 September 2014. ^ "World premiere of Band Aid song". BBC News. 16 November 2004. Retrieved 22 September 2014. ^ "Australian-charts.com – Band Aid 20 – Do They Know It's Christmas?". ARIA Top 50 Singles. ^ "Austriancharts.at – Band Aid 20 – Do They Know It's Christmas?" (in German). Ö3 Austria Top 40. ^ "Ultratop.be – Band Aid 20 – Do They Know It's Christmas?" (in Dutch). Ultratop 50. ^ "Ultratop.be – Band Aid 20 – Do They Know It's Christmas?" (in French). Ultratop 50. ^ "Danishcharts.com – Band Aid 20 – Do They Know It's Christmas?". Tracklisten. ^ "Band Aid 20: Do They Know It's Christmas?" (in Finnish). Musiikkituottajat – IFPI Finland. ^ "Lescharts.com – Band Aid 20 – Do They Know It's Christmas?" (in French). Les classement single. ^ "Offiziellecharts.de – Band Aid 20 – Do They Know It's Christmas?". GfK Entertainment Charts. ^ "Chart Track: Week 49, 2004". Irish Singles Chart. ^ "Italiancharts.com – Band Aid 20 – Do They Know It's Christmas?". Top Digital Download. ^ "Dutchcharts.nl – Band Aid 20 – Do They Know It's Christmas?" (in Dutch). Single Top 100. ^ "Charts.nz – Band Aid 20 – Do They Know It's Christmas?". Top 40 Singles. ^ "Norwegiancharts.com – Band Aid 20 – Do They Know It's Christmas?". VG-lista. ^ "Spanishcharts.com – Band Aid 20 – Do They Know It's Christmas?" Canciones Top 50. ^ "Swedishcharts.com – Band Aid 20 – Do They Know It's Christmas?". Singles Top 100. ^ "Swisscharts.com – Band Aid 20 – Do They Know It's Christmas?". Swiss Singles Chart. ^ "Best of 2004". IRMA. Retrieved 28 July 2014. ^ "End of Year Charts: 2004" (PDF). UKChartsPlus. Retrieved 28 December 2014. ^ "Band Aid 20 "Do They Know It's Christmas?"". IFPI Denmark. 3 January 2018. Retrieved 9 January 2018. ^ "British single certifications – Band Aid 20 – Do They Know It's Christmas?". British Phonographic Industry. Retrieved 28 July 2014. Select singles in the Format field. Select Platinum in the Certification field. Type Do They Know It's Christmas? in the "Search BPI Awards" field and then press Enter. ^ "Do they know it's 2014? Geldof puts Band Aid back together 30 years after it first topped the chart". Daily Mail. 10 November 2014. Retrieved 11 November 2014. ^ "Elbow and Ed Sheeran among Band Aid 30 artists". BBC News. 10 November 2014. Retrieved 11 November 2014. ^ "Band Aid 30 details revealed: line-up to feature Adele, One Direction, more". 10 November 2014. ^ "Band Aid 30-line-up: A clickable guide of who's who". BBC. 17 November 2014. Retrieved 5 October 2015. ^ "BAND AID 30 - Do They Know It's Christmas? (Dt. Version, 2014) - Diskografie". www.universal-music.de. ^ "Australian-charts.com – Band Aid 30 – Do They Know It's Christmas? (2014)". ARIA Top 50 Singles. Retrieved 22 November 2014. ^ "Austriancharts.at – Band Aid 30 – Do They Know It's Christmas? (2014)" (in German). Ö3 Austria Top 40. Retrieved 26 November 2014. ^ "Ultratop.be – Band Aid 30 – Do They Know It's Christmas? (2014)" (in Dutch). Ultratop 50. Retrieved 24 November 2014. ^ "Ultratop.be – Band Aid 30 – Do They Know It's Christmas? (2014)" (in French). Ultratop 50. Retrieved 24 November 2014. ^ "Band Aid 30 Chart History (Canadian Hot 100)". Billboard. ^ "Danishcharts.com – Band Aid 30 – Do They Know It's Christmas? (2014)". Tracklisten. Retrieved 29 November 2014. ^ "Lescharts.com – Band Aid 30 – Do They Know It's Christmas? (2014)" (in French). Les classement single. Retrieved 24 November 2014. ^ "Offiziellecharts.de – Band Aid 30 – Do They Know It's Christmas? (2014)". GfK Entertainment Charts. Retrieved 24 November 2014. ^ "Chart Track: Week 47, 2014". Irish Singles Chart. Retrieved 21 November 2014. ^ "Italiancharts.com – Band Aid 30 – Do They Know It's Christmas? (2014)". Top Digital Download. Retrieved 22 November 2014. ^ "Band Aid 30 Chart History (Japan Hot 100)". Billboard. ^ "Dutchcharts.nl – Band Aid 30 – Do They Know It's Christmas? (2014)" (in Dutch). Single Top 100. Retrieved 22 November 2014. ^ "Charts.nz – Band Aid 30 – Do They Know It's Christmas? (2014)". Top 40 Singles. Retrieved 21 November 2014. ^ "Norwegiancharts.com – Band Aid 30 – Do They Know It's Christmas? (2014)". VG-lista. Retrieved 29 November 2014. ^ "Official Scottish Singles Sales Chart Top 100". Official Charts Company. Retrieved 23 November 2014. ^ "SloTop50: Slovenian official singles weekly chart" (in Slovenian). SloTop50. Retrieved 6 October 2013. ^ "Spanishcharts.com – Band Aid 30 – Do They Know It's Christmas? (2014)" Canciones Top 50. Retrieved 22 November 2014. ^ "Swisscharts.com – Band Aid 30 – Do They Know It's Christmas? (2014)". Swiss Singles Chart. Retrieved 24 November 2014. ^ "Official Singles Chart Top 100". Official Charts Company. Retrieved 23 November 2014. ^ "Band Aid 30 Chart History (Hot 100)". Billboard. ^ "Austriancharts.at – Band Aid 30 – Do They Know It's Christmas? (Deutsche Version / 2014)" (in German). Ö3 Austria Top 40. Retrieved 4 December 2014. ^ "Offiziellecharts.de – Band Aid 30 – Do They Know It's Christmas? (Deutsche Version / 2014)". GfK Entertainment Charts. Retrieved 4 December 2014. ^ "Swisscharts.com – Band Aid 30 – Do They Know It's Christmas? (Deutsche Version / 2014)". Swiss Singles Chart. Retrieved 4 December 2014. ^ "End of Year Singles Chart Top 100 - 2014". Official Charts Company. Retrieved 10 December 2015. ^ Myers, Justin (8 December 2016). "Christmas Number 1 Flashback: Do They Know It's Christmas?". Official Charts Company. Retrieved 8 December 2016. ^ "British single certifications – Band Aid 30 – Do They Know It's Christmas? (2014)". British Phonographic Industry. Retrieved 27 December 2014. Select singles in the Format field. Select Gold in the Certification field. Type Do They Know It's Christmas? (2014) in the "Search BPI Awards" field and then press Enter. ^ "Do They Know It's Christmas? (Deutsche Version / 2014)". ^ "Do They Know It's Christmas? (German + UK Version)". ^ "Do They Know It's Christmas? (German + UK Versionen)". This page was last edited on 26 March 2019, at 16:46 (UTC).